YES! I WANT TO BUILD MY LEADERSHIP AND PERFORMANCE SKILLS WITH ONGOING COACHING FROM ANDREW FOR THE BOOTCAMPER-ONLY SPECIAL PRICE OF $39/MONTH! Check the box below and we'll give you this LIMITED, INTRODUCTORY-RATE to my Leadership Monthly Live mentoring program! This is special rate, currently 20% lower than offered to non-bootcampers. It’s also your guaranteed, never-will-change rate as long as you remain a member of this monthly program. Live monthly sessions with Q&A where I'll train you on my best leadership development insights to help you reach your highest level of performance and enjoyment in all you do! Access to current and archived recordings (as long as your membership remains active). Monthly workbooks, lessons, challenges and more to ensure you are "working the lessons." Additional monthly #PEPTALKS to keep you motivated and working toward your challenges and goals. Private community access to your fellow leaders! Please note: This price will be rising soon as we are still in the introductory-period. Take advantage of this opportunity NOW! You can cancel this membership program at any time. You will, of course, keep your Job Search Boot Camp program with lifetime access. Just check the box and get all those extras for ONLY $39/month! 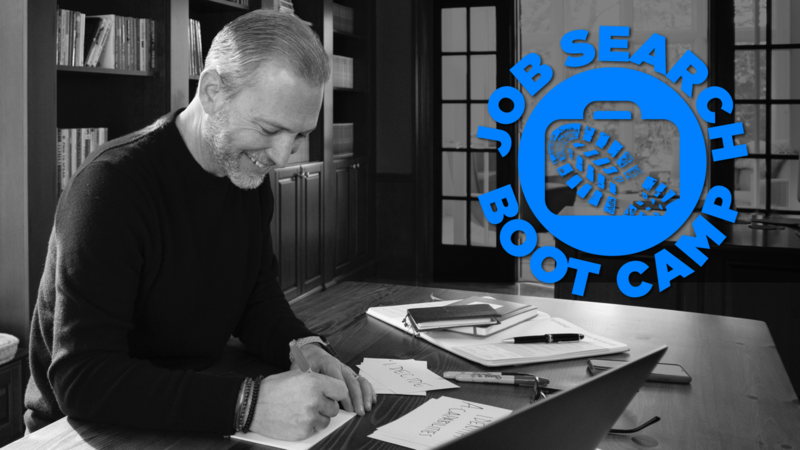 Enroll in Andrew LaCivita’s Job Search Boot Camp Program with the added Resume Review! This is a short recap of all the included material. Please review the full program over page for all details, benefits, bonuses, previews, and frequently asked questions. 5 DEEP, POWERFUL SESSIONS (LIVE AND ON DEMAND) (VALUE $597): These training sessions cover everything you need to know to identify, find, and secure the right career for you! BONUS #1: AUDIO, WORKSHEET, AND EBOOK DOWNLOADS (VALUE: WHO KNOWS? ): Listen to the recorded lessons on-the-go and take your mastery to the next level with the information-packed, helpful worksheets, guides, and eBooks that accompany these training modules. BONUS #2: INTERVIEW INTERVENTION DIGITAL BOOK EXPERIENCE (VALUE: $27): Get the eBook, audiobook, chapter notes, guides, and much more. This book has been downloaded or purchased by more than 150,000 people looking to improve their careers! BONUS #3: ULTIMATE CAREER COURSE (VALUE $497): More than 50 videos on everything you need to secure the right career and job for you! These 2-10 minute videos serve as a fabulous supplement to the deep boot camp sessions! BONUS #4: BUILD YOUR ULTIMATE PROFESSIONAL RESUME COURSE + WORKSHOP (VALUE $297): The ultimate program in resume and cover letter writing as well as building a killer LinkedIn Profile! BONUS #5: INTERVIEW INTERVENTION COURSE (VALUE $297): The program based on the industry-leading job interviewing methodology, this video-based interview and salary negotiation course serves as another fantastic supplement to the boot camp sessions! BONUS #6: CAREER ACCELERATOR PROGRAM (VALUE $397): 5 deep modules on the systems and skills you need to get promoted within your first year on the job and accelerate through the ranks! BONUS #7: ACCESS TO THE MILEWALK ACADEMY PRIVATE FACEBOOK GROUP (VALUE: PRICELESS! ): Ask questions and share insight with others in the community and take advantage of discount coupons I offer on additional future training because you’d be a repeat customer. BONUS #8: ONGOING ACCESS TO US AND OTHER STUDENTS (VALUE: $468): A unique element to my training courses is direct interaction with me, my team, and other students via the training site. Comment, ask questions, and support others on a lesson-by-lesson basis. Get the help you need on the subjects you need it!